Elections provide opportunities for citizens to participate in politics and hold leaders to account. When they work well, elections can deepen civic engagement, inform public debate, stimulate party competition, and allow the peaceful resolution of political conflict. The problem is that too often contests fail to achieve these objectives. There is widespread concern in many countries about low or falling turnout, public disaffection, party polarization, and the failure of elections to ensure legitimate outcomes. Electoral malpractices continue to undermine contests around the world, from overt cases of violence and intimidation to disinformation campaigns, cybersecurity threats, barriers to voting, and the under-representation of women and minority candidates. To assess global trends, the Perceptions of Electoral Integrity expert survey monitors elections worldwide and regionally, across all stages of the electoral cycle. 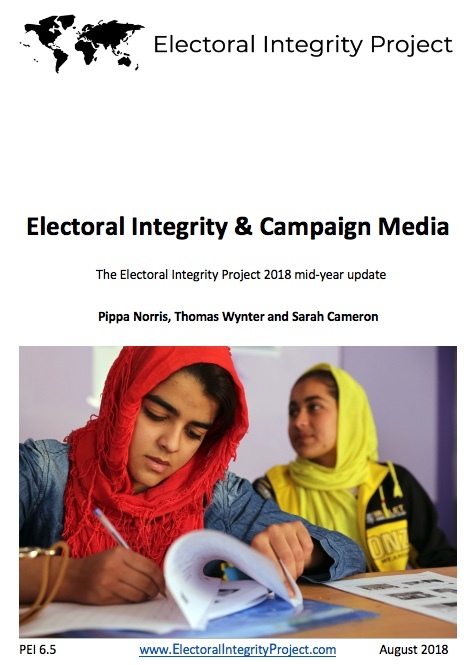 This new 2018 mid-year report describes the latest update of the Perceptions of Electoral Integrity dataset (PEI 6.5). The release is drawn from a survey of 3,534 expert assessments of electoral integrity across 312 elections in 166 countries around the world. The cumulative study covers national presidential and parliamentary elections from July 1, 2012 to June 30, 2018. This release (PEI 6.5) adds 26 presidential or parliamentary contests held from 1 Jan 2018 to 30 June 2018. The first half of 2018 saw a range of important national elections in all regions of the world. Experts evaluated the electoral integrity scale most highly in 2018 in the Presidential elections held in Finland and Costa Rica, confirming the results of previous reports. At the other end of the scale, however, in Iraq, a turbulent contest saw ballots subject to a recount set ablaze, exacerbating tensions amid widespread electoral malpractices. In Lebanon, the first national elections held since 2009 marked a step forward, but the contest was marred by endemic corruption, clientelism, and interference from outside forces. A shock victory for the opposition in Malaysia was particularly remarkable in light of the odds stacked against them by systemic electoral malpractices favouring the incumbent. Despite a peaceful transition of power, Malaysia continues to score near the bottom globally on the sub-dimensions of electoral laws, electoral boundaries, campaign finance, and electoral authorities. Electoral reform on these issues would help to safeguard fair and competitive elections in Malaysia. PEI experts suggest that Italy’s 2018 elections performed relatively poorly on the PEI Index compared with other states in Northern and Western Europe. Italy was assessed poorly on campaign media. Politicization of media regulation, lack of media diversity, and harsh libel laws undermine the capacity of Italian citizens to make informed political choices. The Kremlin’s proactive measures to prevent the existence of any genuine consolidated opposition, the absence of free press, and loyalist security forces served to preserve Putin's rule. Russian elections are characterized by widespread voter intimidation, by the jailing of political opponents, and by state repression of independent journalism. OSCE criticisms are confirmed by the relatively poor performance of Russia’s 2018 election on the PEI Index, with particularly severe weaknesses of electoral laws and campaign media. Incumbent President Maduro inherited and expanded upon Chavez’s mechanisms of political control, which empowered him to suppress political opposition and the free press. Venezuela performs extremely poorly on all dimensions of electoral integrity, well below the global average on all dimensions. Venezuela’s PEI Index score has halved across its past three Presidential elections, from 54 in 2012 to 27 in 2018. This decline has been driven in large part due to major falls in the quality of the electoral laws, electoral procedures, party registration, and electoral authorities. Much recent concern has focused on Russian meddling, fake news and hate speech in the 2016 US election, as well as similar problems in the Brexit referenda and in elections in Germany, France and Spain. Reported problems include misinformation campaigns online and cybersecurity attacks on official voting records. This has raised broader questions about the integrity of campaign media in elections. But how extensive are these types of problems? Are they confined to a few well-known cases, including the US, or are they more widespread in contests around the world? 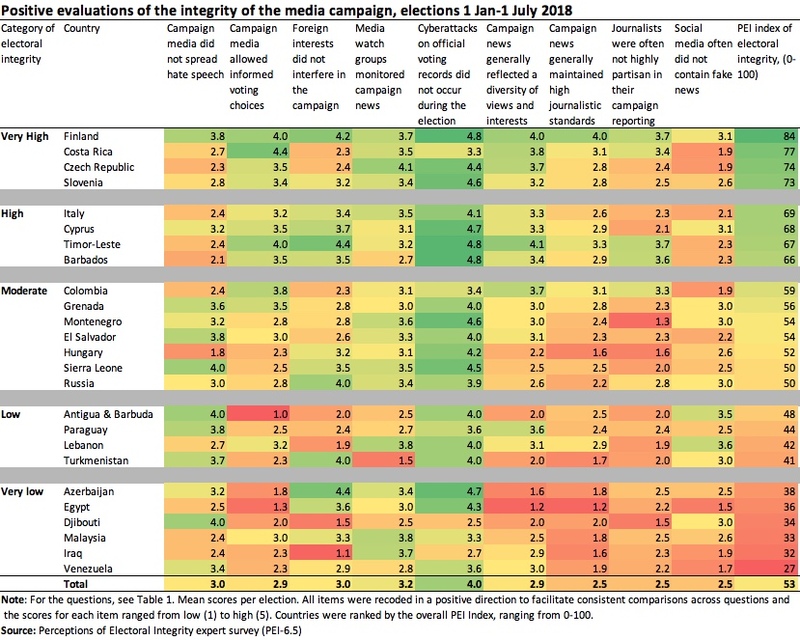 Despite widespread concern, and regular annual indices concerning freedom of the press and the internet around the world, little systematic evidence has been gathered to monitor the integrity of campaign media in elections across countries and varied types of regimes. To monitor the extent of the risks, the 6th wave of the PEI expert survey included several items from a new rotating annual battery designed to capture several of these issue, including “fake news”, partisan media, foreign meddling, and media monitoring. Further analysis of these data will be forthcoming in the PEI 7.0 release with additional countries and elections, once the 2018 round of the survey is complete. Nevertheless we can look at an initial snapshot of the results for 26 elections held from 1 Jan to 1 July 2018. The results below show that countries which generally perform poorly in elections overall, such as Egypt, Djibouti, and Venezuela, commonly have the most problems in media campaigns as well. But it is worth highlighting that some other specific weaknesses also emerge, such as partisan reporting in Montenegro, poor journalistic standards following government repression of the press in Hungary, and fake news on social media in Costa Rica and the Czech Republic. The siler lining from the results is that in most cases experts reported that few elections were subject to cyber attacks on official voting records. The next report, with a broader range of elections throughout 2018, will examine these issues in more depth. The report provides full technical information about the methods, distribution and analysis of the Perceptions of Electoral Integrity survey. For more details, download the complete PDF report. And get the electronic dataset via PEI's Dataverse.